A key Republican senator responsible for oversight of the federal workforce said on Thursday President Trump’s proposed 2019 federal pay freeze would be harmful to agencies looking to retain quality employees and recruit new ones, throwing cold water on a policy the White House suggested in its recent budget blueprint. 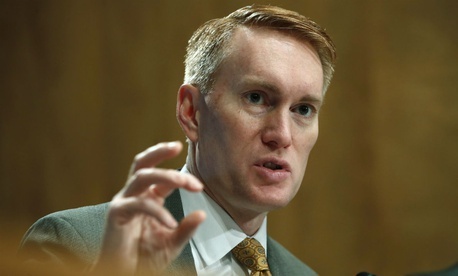 Sen. James Lankford, R-Okla, who chairs the Homeland Security and Governmental Affairs Committee’s federal management panel, made the comments after a hearing on ways federal managers can improve the hiring process. Lankford and other lawmakers repeatedly pressed Trump administration officials on how they could streamline the onboarding of new employees and recruit better workers, and the chairman said after hearing testimony that freezing federal pay would not be helpful in achieving those goals. Lankford has supported employee buyouts as one tool agencies can use to streamline operations, and wants to pay more to employees who accept those voluntary offers. He has put forward a bill to raise the maximum Voluntary Separation Incentive Payment from $25,000, the level at which it has remained since Congress introduced the program in 1993, to $40,000. The measure has won approval in committee and Lankford said Thursday there’s been “no grand pushback” on it and he is looking for a mechanism to get it to Trump’s desk. In addition to the pay freeze, Trump suggested in his budget that federal employees contribute more toward their pensions and lose eligibility for a Social Security supplement for those who retire early. He also proposed getting rid of cost-of-living adjustments for most retirees’ annuities, decreasing general returns from the Thrift Savings Plan, reducing paid time off, and having employees pay a higher portion of their health insurance premiums, among other changes. Federal employees received a 1.9 percent across-the-board pay raise in 2018.